Creative Coach Collision Repair and Design Center in Lakeland, FL is your go to collision repair contractor. 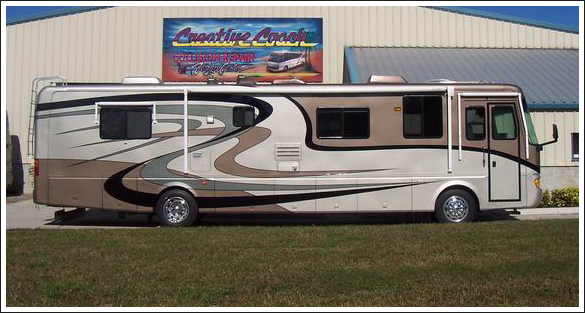 From minor body work to heavy collision repair, you can depend on Creative Coach Collision Repair and Design Center in Lakeland, FL to restore your motorhome to its better-than-new condition. If your coach is immobilized, towing or transport can be arranged from almost anywhere in the US no matter where you are located. We understand that an accident is usually a stressful experience. This is why Creative Coach offers our clients with a "hassle-free" experience while performing superior collision repairs. Being insurance specialists and working with many insurance companies, we will handle your claim from start to finish. We will work our hardest to minimize your inconvenience and get you "back on the road again" as soon as possible. If you’re looking for “peace of mind” and “quality workmanship” for your damaged motorhome, you can place your confidence in the “Family Team of Experts” at Creative Coach. Our talented teams of body, and paint experts utilize the most sophisticated technology and the finest paints available. We perform warranty work for most major motorhome manufacturers. 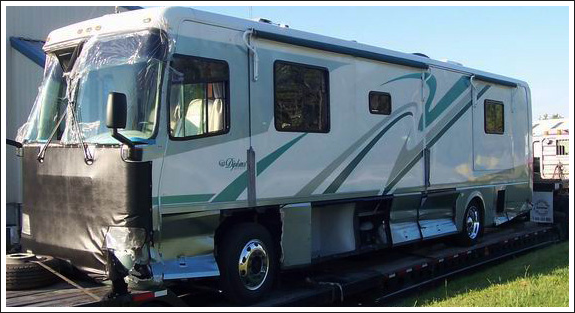 Give us a call and discuss your motorhome repair needs.